Corrected on 10 April 2015 at 12:30 am. The corrections are indicated in red. Altogether 2,146 candidates were nominated for the 2015 Parliamentary elections, which is 169 fewer than in the previous Parliamentary elections. Fifteen registered political parties take part in the Parliamentary elections. Of the registered parties, Sinivalkoinen Rintama - Blue and White Front r.p. did not nominate a candidate for the elections. Two fewer parties participate in the elections than in the previous Parliamentary elections. The data are based on Statistics Finland's statistics on the nomination of candidates for the Parliamentary elections 2015. Of all candidates, 73.7 per cent have been nominated by the parties elected to the present Parliament (National Coalition Party, Finnish Social Democratic Party, The Finns Party, Centre Party of Finland, The Left Alliance, Swedish People's Party in Finland, Green League, Christian Democrats in Finland). Of the parties with no MPs in the present Parliament, the Independence Party ( 151 candidates) nominated most candidates and For the Poor (5 candidates) the least. A total of 31 candidates outside any party were nominated in the entire country. A majority of the candidates in the Parliamentary elections have always been men. In the Parliamentary elections 2015, altogether 1,301 of the candidates are men and 845 women. Women's proportion of candidates is thus 39.4 per cent, which is 0.4 percentage points higher than in the 2011 Parliamentary elections. When comparing with the previous Parliamentary elections, the proportion of women candidates among the candidates for the party decreased for three parliamentary parties. The proportion of women candidates fell most in the Centre Party of Finland, by 1.4 percentage points. 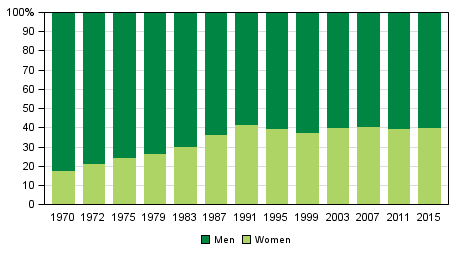 The proportion of women candidates grew most in the Green League, by 4.5 percentage points. The proportion of women candidates is smallest for the Finns Party (35.3 per cent of candidates) and highest for the Green League (56.3 per cent of candidates). The average age of all candidates is 45.8 years, that of male candidates is 46.1 and that of female ones 45.2. Of all candidates, 1,353 are aged 40 or over. Of the candidates, 18 are aged 75 or over and 111 are aged 25 or younger. The age of the candidate is the age on the election day. The national register of candidates is published on the Internet pages of the Ministry of Justice (www.vaalit.fi/en/). More detailed data on the candidates can be found in the review: Background analysis of candidates in the Parliamentary elections 2015. ISSN=1799-6279. nomination of candidates 2015. Helsinki: Statistics Finland [referred: 25.4.2019].